Consumer goods companies rely on forecasts to support inventory planning and distribution across their sales channels. 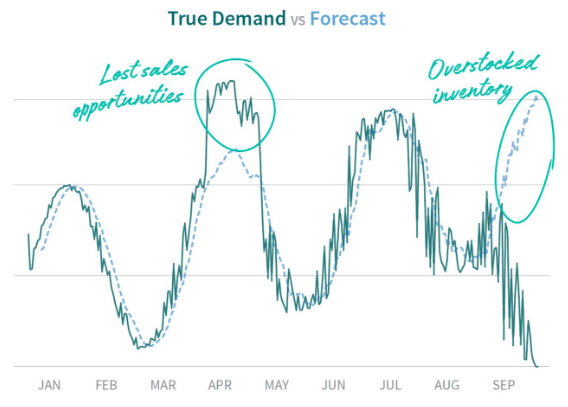 Building accurate demand forecasts requires more than just an understanding of the latest machine learning techniques; it also requires the right data and an understanding of the potential costs of incorrect estimates. Applied correctly, the statistical and mathematical techniques used by data science teams can help companies across the consumer goods spectrum optimize operations and increase revenue, while reducing unnecessary costs. However, even a seemingly small decision can lead to a faulty business strategy. Below, we’ll explore two of the top forecasting errors consumer brands commit, along with suggestions for how to avoid these pitfalls. To speed up and simplify the forecasting process, companies may start by building forecast models using a top-down approach, selecting the top products’ or category’s sales data across an entire retailer. But using this approach instead of using individual, location-level unconstrained demand can cause significant under-prediction bias when estimating true demand, due to out-of-stocks — how many units would you have sold in July if you didn’t run out of stock in the third week of the month? Computing your forecast against prior sales doesn’t account for lost sales due to out-of-stocks, causing any future forecast to be artificially depressed, and the cycle to continue. Even if you’re looking at out-of-stocks in your forecast or planning process, if you aren’t measuring demand for individual locations, you’ll still miss the mark. Low inventory situations might occur only in certain regions, during certain times of the year, or even across specific product categories. Simply averaging out the out-of-stock numbers won’t yield an accurate forecast, because when out-of-stocks are clustered around specific categories in space and time, their effect can get washed out in the shape of the overall demand signal. When building models, make all adjustments for out-of-stock occurrences for each location, and adjust forecast models accordingly. After adjusting the data to account for store-level true demand, even the best forecasts won’t be 100% precise. Most standard forecasting methods optimize for unbiased estimators, penalizing over-predictions and under-predictions similarly, and only adjusting for the size of the deviation. However, in retail, the relative cost of errors can vary greatly. Under-forecasting demand will lead to increased out-of-stocks, so while you’ll carry less inventory, you’ll also be left with reduced profits. On the other hand, over-forecasting demand will result in fewer out-of-stocks but expose you to the risk of carrying a larger amount of inventory. While both scenarios can lead to undesirable outcomes, the severity of those outcomes depends on the specific industry a brand is working in. For example, a fashion company might view over-forecasting as a deadlier sin than under-forecasting, because while lower inventory levels may possibly lead to out-of-stocks and lost sales, excess inventory will certainly lead to markdowns, returned inventory, and sunk costs. Similarly, manufacturers of large appliances may also view carrying too much inventory as more detrimental than out-of-stocks, because the excess products take up a lot of expensive storage and shelf space. With more seasonally-driven brands with high margins, however, overstocking products is likely preferable to understocking. A toy company would rather slightly overstock inventory but meet full consumer demand during the last two weeks of December than miss out on sales during the most important buying window of the year. To solve for the fact that not all forecast misses are created equal for every brand, and can even vary across products within a brand, companies should use a custom asymmetric loss function that fits their particular industry’s needs. This approach allows for tuning a forecast model to optimize for avoiding the “misses” that are most detrimental. The ultimate outcome of this technique will be better than a traditional cost function or quality-of-fit metric, which may treat all forecast errors as equally impactful. Smart forecasting is a powerful tool in today’s increasingly-competitive retail landscape, allowing companies to make information-driven decisions that optimize revenue. Thoughtful data science practices result in more precise analysis and forecasts that can be incredibly useful, but it’s easy to fall victim to simplifying mistakes in data or modeling, and thereby reduce the value of your predictions. This post originally appeared on insideBIGDATA.